In Somalia the threatened palm Livistonia carinensis is found. 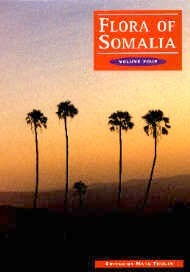 Somalia is situated in North East Africa. In this country the plants have been unknown to science for a long time. Today scientists at Uppsala University are writing the first real flora for Somalia. They assume that there are about 3000 plant species in the country. About 400 of them are new to science and will be described and recorded for the first time. Linnaeus sent his pupils to all corners of the world, but none of them travelled to Somalia. It would last a hundred years after Linnaeus’ death until the first plant was collected from Somalia and the first attempt to a list of the plants was not compiled until the 20th century. Somalia is a dry country with mainly semi desert vegetation. Nevertheless, there is a rich flora with many interesting plants. The best known are the frankincense trees from which sap has been collected and used as incense for thousands of years. The scientists who are writing the flora have been able to reveal which tree species give incense and in what parts of the country they grow. Until recently mostly foreign scientists have explored the plant world of Somalia. Now several Somali botanists are being trained with help from Sweden and other countries. It has been difficult to work and travel in Somalia because of the ongoing civil war. Despite this situation the flora work has continued.